Alexander Stewart’s unusual, captivating films explore patterns and connections in the world around us through a variety of methods and styles. Animation sits next to live-action, and narrative elements combine with formal experimentation. Behind these different approaches lies a strong and singular vision, and an infectious fascination with the potential of the moving image as an art form. 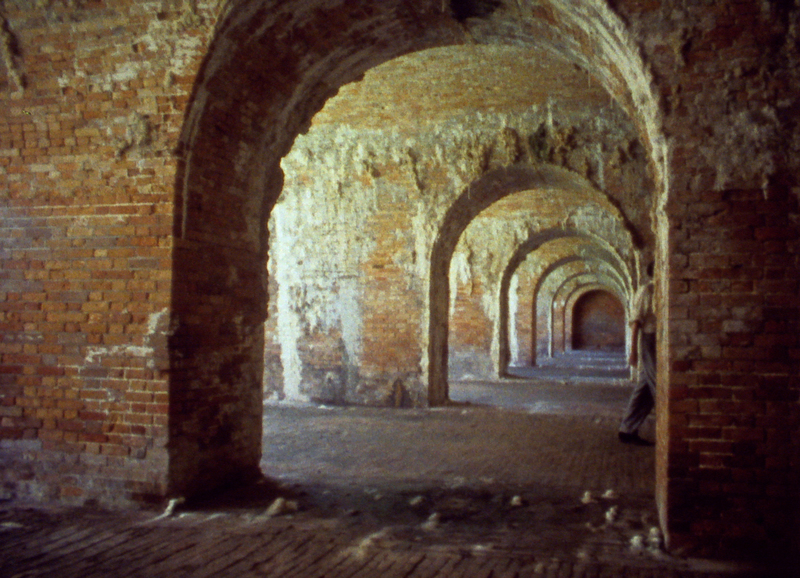 A number of his films, including the extraordinary Fort Morgan (2014), make connections between processes of animation and natural processes like the formation of rocks and crystals or the movement of the stars. The animated photocopies of his 2005 film Errata at times bring to mind gradual accretions of sediment, or other natural phenomena as seen through timelapse photography. Alexander’s films often evoke something of the scientific and educational films of the late 1970s and early 1980s. Geometric, linear animation recalling scientific diagrams and the use of models and reenactments filmed in 16mm carry strong associations and memories. Yet his films avoid pastiche or deliberate homage, rather they are complex and subtle, lodging in the mind long after viewing them. Alexander’s films have shown around the world including at the International Film Festival Rotterdam, the Slamdance Film Festival, the Ann Arbor Film Festival, and ImageForum in Japan. He has worked with musicians such as Sam Prekop and White/Light, and has also made a series of notable music videos. Further broadening the diverse range of his filmography he has also collaborated on an animation (Crux Film, 2013) with his wife Lilli Carré. In addition to his work as a filmmaker and artist, Alexander is also co-director of the Eyeworks Festival of Experimental Animation with Lilli, and teaches animation at DePaul University. Having already interviewed Alexander (along with Lilli) about Eyeworks, I was keen to conduct another interview focusing on his artistic and filmmaking practice. EoF: Can you tell us a bit about your background and how you became an artist, filmmaker and programmer? AS: Ever since I was a little kid I’ve been interested in art, mostly drawing and painting. I got more serious about it in college, when I started making sculpture. I remember getting really excited about Mondrian after learning about him in art history class. His paintings introduced me to thinking about using rules and limitations as the basis for making work. Then I found out about Sol LeWitt, and he was really my favorite. I had a vague idea of what experimental animation was from reading an article in college about Robert Breer and seeing some stills of his work, and I thought it sounded really cool. I didn’t really have much exposure to experimental film or video art or anything like that until I went to the School of the Art Institute of Chicago for graduate school. I think it was seeing a few specific films that really galvanized my interest in experimental film: Pat O’Neill’s Water and Power, Jordan Belson’s Allures, and some films by Takashi Ito. The idea of making “experimental films” sounded to me like the coolest possible type of art. Animation seemed like it offered an enormous amount of ways to experiment with the image and with film. As for how I got into programming film, in 2006, my friend opened a gallery in Chicago called Roots & Culture, and asked me to do a monthly screening series there, which I ended up doing for six years. That was my first experience with film programming, and I really liked it. During that time I was getting more and more into animation, and Lilli and I had an idea to create a platform specifically dedicated to experimental animation. We started the Eyeworks Festival in 2010, and it’s been a lot of fun and really rewarding so far. As far as making film goes, I think of myself as a visual artist first, and a filmmaker second, and an animator third, in sort of nested identifications. I really like what film lets me do as an artist, in terms of working with time, light, transformations, juxtapositions, and presenting the work in a theater or cinema space. EoF: How do you tend to begin making a film? Do you find you usually start with ideas of process / form, or more related to the content? To what extent are your works planned out and considered in advance? AS: Often I find that I’ve started a film before I really know I have. I’ll think about a particular visual idea in the back of my mind, or imagine a way to do a particular shot for a few days, and then gradually I’ll realize that I’m working on a new film. I really like letting films grow naturally out of my broader practice or my interests. I am very interested in process in my work, and I like to work with the idea of a structure, process, or form, and then try and let that become the content in some way. My film Peacock was made that way, as I was thinking about the idea of representing something existing in two states at once, and something moving in and out of phase with itself. I started experimenting with multiple-exposures in-camera, and color separations in AfterEffects, and kept following what was working until I had a full piece. I’ve also worked in the opposite way for some projects, like my recent film Fort Morgan and my film about track-bike racing, The Battle of the Stand-Stills. With those pieces, I let the content lead me to the structure. I started with specific subjects I was interested in, in this case, the geometry of a fort and the life-cycle of an oyster. I tried to find conceptual and formal ideas that these things suggested, and use that to structure the film. It was a more organic process, akin to a studio art practice of letting the ideas come out of working with the materials. EoF: You have used quite different technical / formal approaches in your work, are there any elements of your working process which carry through all your films? AS: One thing that resonated with me when I was learning about experimental film is that there are conceptual possibilities opened up by the idea that moving images are constructed from still images. That’s probably why I’m so drawn to animation, because it’s a way of making moving images that is so obviously constructed, and because of that has so many possibilities for manipulation and expression. I’m also very interested in images that have a fine line between recognizability and total abstraction; shooting something real in a way that transforms it into something unrecognizable or graphic. On a more thematic level, I really am drawn toward gradual processes and some forms of automation. I like the idea of setting up a system and removing myself as much as possible to see what happens. I think that covers my interest in time-lapse, moiré patterns, and automatic drawings, and other things that use repetition of very simple methods to make something that is more interesting than the sum of its parts. I also really like when a process I am engaging produces results that surprise me. EoF: Is animation central to your practice or do you see it as just another form of filmmaking? AS: Animation is a kind of filmmaking that really resonates with my interests, but if I think if I were pressed I would say that I don’t think of myself as an animator. I wouldn’t say it’s “just another form of filmmaking,” because I see it as really different from live-action filmmaking or shooting objects in real-time, and much more interesting to me as a thinker and an artist. I am interested in graphic images, painting, drawing, design, etc., and I’m also very interested in the idea of accumulating things slowly and realizing something through the aggregation. Both of those intersect for me in the practice of animation. I’m attracted to animation because it is so wonderfully open ended. It’s really the perfect artistic medium for the kind of thinking I want to do. I’m talking less specifically about character animation here and more broadly about the idea of constructing a film from nothing, and having it be exactly like you want it to be. It’s a medium that has room for everything I’m interested in: time, material, sound, color, light, narrative, expression, structure, process, and probably some things I don’t even know I’m interested in yet. EoF: The idea of the passage of time made visible through physical processes recurs throughout your work. How conscious have you been of exploring this idea in your work? Where does it stem from? AS: As I mentioned, a lot of my work is motivated by the idea of working with accumulating things – gestures, actions, objects, layers. For a long time I’ve been interested in seeing what’s visible when something is viewed at a different scale, either a physical scale or a time scale. Seeing the film Koyaanisqatsi in college was a real revelation for me. Even though my tastes have changed somewhat since then, I think the idea Koyaanisqatsi was trying to give a new and perhaps truer view on what our Western civilization actually looks like through something as simple compressing time is still very interesting to me. EoF: I am interested in your use of 16mm film to shoot on. Has using it been primarily an aesthetic choice or for other reasons? AS: Shooting on 16mm is a real pleasure. It makes me value what I’m shooting differently. I pay attention to what’s in front of the camera differently, and my sense of time is heightened. It also makes me value what I shoot more, and look more closely at the footage I get back from the lab. What I learned about photography from the Bolex has really informed I think of moving images in general, in terms of accumulation of light to make a frame, the value of a single frame, and the relationship between frames. On one hand, I am much more fluent with digital tools, like shooting digital images and working in Photoshop and AfterEffects. But, shooting on 16mm has been an important part of my practice for a while, and I think it grounds me in terms of the 16mm format being historically the format of artists films. EoF: For me, some of your films evoke a feeling of educational films or nature documentaries of the 1970s to early 1980s, Fort Morgan and Crusts especially. Are such films from this time period a point of reference? AS: Sure! I love that aesthetic. I think in science films of that era there’s an interest in visualization of abstract concepts using graphic images and models that I respond to. The classic Ray & Charles Eames film Powers of Ten is a good example. It’s such an interesting way of experiencing the concept of exponential scale. I like where those films sit in the history of cinema – a semi-professional product, situated somewhere between amateur and Hollywood productions, and now likely orphans of history, like cousins to avant-garde films. EoF: Fort Morgan has a strange and mysterious quality to it, and I’m torn between wanting to preserve this mystery and wanting to know more about the ideas behind it. What can you tell me about the film? How did the ideas for it begin? AS: Fort Morgan is the largest project of any sort that I’ve done. I worked on it on and off for about six or seven years. I started it not knowing where it would end up or what exactly it would be. That’s a funny way to make a film. But, I knew I wanted to make something about this incredible old fort near my hometown in Alabama that I used to visit as a child, so I started taking my Bolex there and shooting. All of the ideas grew out of the fort itself; visually and conceptually. I was really interested in the design of the fort, the geometric plan. I remember my grandfather taking me there when I was little. He was a civil engineer and so he was really interested in buildings and systems and angles and trigonometry. He explained to me how the fort was designed perfectly, with all the angles figured out to give interlocking fields of fire against any attack, and I remember thinking that was really important. There are lots of other ideas that came from the history of the fort itself, like that the mortar used to bind the bricks was made from crushed oyster shells, and now the mineral deposits leeching out of the fort contain calcite from the shells. You can see those in the film. I worked with animation, time-lapse and miniatures as different ways to think about the structure and idea of the fort. My biggest challenge was trying to think of a way to tie all of these materials, structures and processes together into something that would be interesting. I came up with the idea of using this figure to move through the spaces and interact with materials. 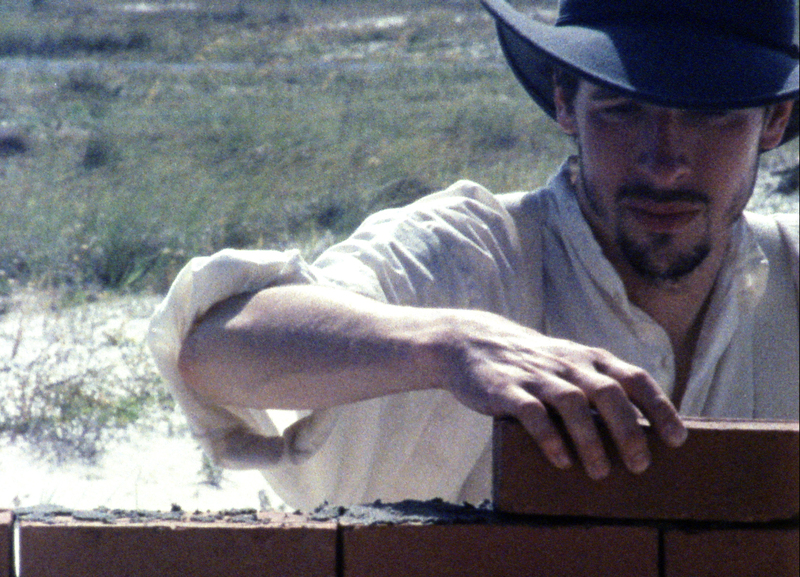 I thinking about films by Maya Deren and Matthew Barney, where the figures are not really “acting” as much as they are doing actions and activating objects. I have an ancestor who was in the Confederate Army and was stationed at the fort during the Civil War, and even though he was never involved in any battles or fighting, he supposedly did some oyster fishing while at Fort Morgan. The figure in the film is based very loosely on my idea of my ancestor. It’s not supposed to be a straight-forward narrative film. I’m trying to use the figure to move the viewer through different spaces and ideas. If I had to sum the film up, I’d say it’s about the hardening of the self. The basic analogy at the core of the film is pretty simple: Man is to Fort as Oyster is to Shell. It’s also about the failure of an idea, about attempting to impose one’s will on the world, and about things outgrowing their original purpose. My hope was to make a film that would be challenging and maybe strange, but still would be an interesting viewing experience, no matter what you were getting out of it. EoF: You made Crux Film with Lilli, your wife, who you also run Eyeworks with. Do you work (in making a film) in similar ways? Has your collaborative work affected the way you work independently? AS: We work in pretty different ways. When we collaborate, I think each of us has the goal to push each other, and to make a creative move that the other person wishes they had made or is jealous of. That’s our main way of conversing creatively. Our collaborations have affected my personal work enormously. I think the drawings and animations we made together have made me more aware of working in the present moment, and have made me less fearful and constipated in my creative practice. They’ve really loosened me up and showed me how to have more fun. One thing that’s been at the core of working with Lilli is that even though we have very different processes and aesthetics in our own practices, we have really similar tastes. We rarely ever disagree on whether something is good or not. We have very similar instincts when responding to work. That’s probably also why we have been able to collaborate on Eyeworks. That makes a huge difference in terms of being able to work with someone on a curatorial project like that. EoF: What can you tell us about your new work ‘Here There’? How did your making a film with Bonobostudio come about? AS: That project developed over a few years. I met Vanja Andrijevi?, the producer at Bonobo, when I went to the 25FPS festival in Zagreb a few years ago. I was very interested in her studio, since it focused on producing animations and experimental film. I had a loose idea for a film, and she thought it would work at Bonobo. It’s been an interesting process to work with a studio and have a producer for an experimental piece like this, and I’ve really learned a lot from it. I’m hugely appreciative of Vanja for facilitating my project. I really admire her energy, professionalism, and her commitment to artists’ films. The film is an animated sketchbook. I made drawings over a few weeks when I went to Croatia for a few months last year. I was thinking a lot about the process of abstraction, both in terms of abstracting experience into drawings and stories, and also the process of abstracting an optical image into a graphic image. The film operates around pushing sketchbook drawings into less and less recognizable graphic abstraction, while trying to maintain something that’s essential about the image or the experience. It’s inspired by the work of Robert Breer and Stuart Hilton, and also by your film Visions of the Invertebrate, which I’m a big fan of. We are hoping to have it done this spring! EoF: Are there any other upcoming projects we can look forward to? AS: I’m working on a piece that uses a laser and mirrors in a dark room to create minimal laser drawings that I shoot on 16mm. I’ve been experimenting with dolly shots to move around the laser drawings. I want the film to walk a fine line between feeling like simple CG and being recognizable as physical arrangements, and be a slightly uncanny experience for the viewer. I’ve been thinking a lot about Len Lye’s film Free Radicals, as well as Fred Sandback’s yarn sculptures. I’m planning to use it as part of a collaborative performance piece. It’s a pretty different piece from Here, There in the way that I’m making it. I used to worry that I wasn’t consistent enough from piece to piece, and that I jumped around too much in my filmmaking, like going from an experimental-narrative-collage piece like Fort Morgan, to an abstract hand-drawn piece like Here, There, to a very formal experiment of shooting laser beams on film. I was concerned that I might alienate people by changing my style and methods that much from piece to piece. I’ve definitely felt that at film festivals, where I really liked a recent work by a filmmaker, and was not sure how to approach the new work of theirs because it was pretty different. But I recently have had a few opportunities to screen a program collecting my films from the past ten years, and I’ve been really happy that people can see strong connections between films that might at first seem pretty different. It’s been encouraging to me to keep making films this way, piece to piece, and not worry so much about the “body of work” as much as exploring what each piece allows me to do. That’s what attracted me to making experimental films in the first place: it allows me seriously explore things I really care about in a way that feels pleasurable and free from expectations, and allows me to produce something that I’m excited to share with people.